Howick - Following two donations on the KZN North Coast and Newcastle, the Power Plate Legacy Project along with the Prime Sports Development Trust, Virgin Active South Africa and the KZN Department of Sport and Recreation have rolled out two more Power Plate machines at Howick High School. 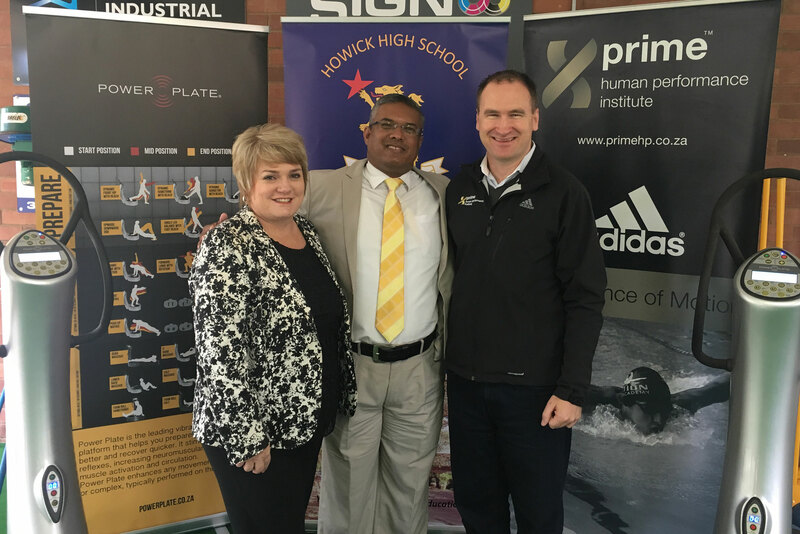 Jay Mannikam, the Deputy Manager at the KwaZulu-Natal Department of Sport and Recreation, praised the work that has been done by Power Plate and the Prime Trust but most importantly for Howick High School for putting up their hands to be a Sports Focus School. "When these opportunities come about we want schools to jump at the opportunity and that is what Howick High School has done," Mannikam said. "We have many Sports Focus Schools in the province but it is great for a school like Howick High to be given the chance to push their athletes to that next level. "We want to see pupils from Howick pushing for even higher honours." Howick High School Principal Mrs Lauren Farquharson echoed the sentiments of Mannikam but added that the passion of the people involved in the Power Plate Legacy Project is unrivalled. "We are incredibly grateful to the Department of Sport and Recreation for acknowledging us as a Sports Focus School as well as to Brendon and the team at Prime, Power Plate and Virgin Active," she said. "To see people with such drive and positive energy is inspiring. "This drives us here at Howick high to push for positive results and we want our athletes to have that same passion and drive." Having been to two locations previously, Brendon Goodenough, who represents the Prime Trust, is hoping that by helping to uplift sport at Howick High School some of these pupils could feed into the elite athlete system.